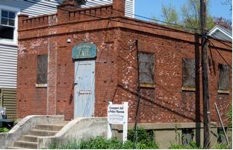 Next door to the brewery is the old Greenport Jail.Built in 1917, this brick and steel building has two cells for men and one for women with each containing a toilet, sink and wooden bench. In the jail’s basement are wooden bunks to accommodate traveling salesmen that may have spent too much time at the brewery. 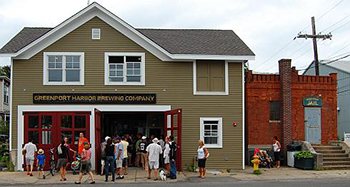 John Liegey and Rich Vandenburgh opened the Greenport Harbor Brewery in an old Fire House in the small town of Greenport at the tip of Long Island. 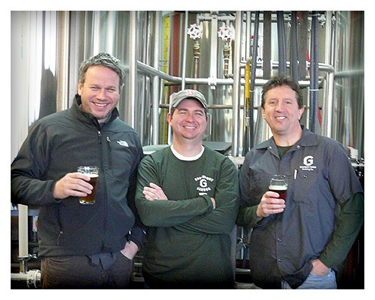 These small craft brewers have won every imaginable award for their seasonal brews. 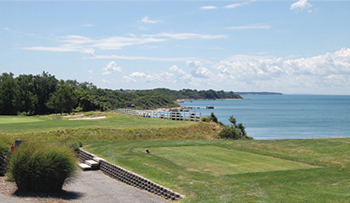 Island’s End is a semi-private 18 hole facility located in the heart of Wine Country on the North Fork of Long Island. Just minutes from the beautiful downtown village of Greenport. At 6,700 yards with 4 selections of tee The par 3 16th is the signature hole overlooking Long Island sound. 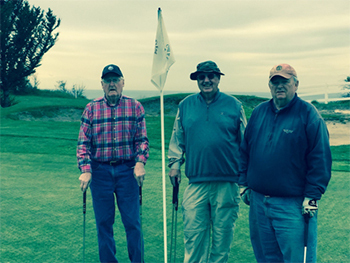 Island End Playing partners Paddy Nolan from Donegal Ireland, John Shack and John Abbott. Great guys. Paddy owned Donegal’s Tavern on the upper west side on NY, John Shack is retired lawyer, Boston College grad and Vietnam vet and John Abbott retired Tax Shelter expert. Low key down to earth crew. Thoroughly enjoyed their company and many thanks to Pro Bill Fish for setting us up. Long Island Sound in the distance.